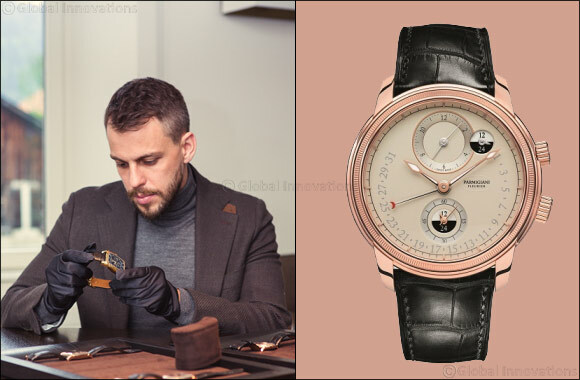 Ilya Sachkov, Forbes global tech-ranking participant, best-dressed according to GQ Russia and not to mention, CEO of one of the global leaders in hi-tech security, became friend of the brand of Swiss luxury manufacture, Parmigiani Fleurier. Young and gifted, self-made businessman, started his company at early 2000s, age of 17, when people used to see cybercrimes only in The Matrix movie. Group-IB today is in TOP-5 among leaders in its sphere worldwide, protecting largest banks, consulting governments and working in cooperation with Interpol and Europol. Cryptocurrency – is not a trendy word for Ilya, his company, Group-IB, protects those technological giants from cyber-crooks worldwide, having offices in Moscow, London, New York, Dubai. Frequent flights, time zone changes are all essential attributes of the active life of the founder of one of the world's largest companies in the fight against cybercrimes. That is why Ilya chose for himself the classic model in pink gold with the second time zone Toric Hemisphere Retrograde, the winner of GPHG (Grand Prix Horlogerie de Genève) 2017 in the Travel time category. Just to add, Ilya prefers to prevent cybercrimes in excellent shape. Sport takes a large part in his life – from the usual training and running to participate in races and team endurance races. Saying so, Ilya came to the headquarters of Parmigiani Fleurier immediately after participating in the Race of heroes, an extreme sports race with obstacles. Drawing attention to the calluses on his hands, David Traxler joked that it is no longer fashionable for the modern man, but says a lot about the character of man. By the way, Ilya's sense of humor and self-irony is also at a high level. Davide Traxler, Chief commercial officer of Parmigiani Fleurier: “Ilya has proven an exceptional commitment to achievement, in business as in sports he always makes the highest effort and expects from himself more than he expects from others. It is also incredibly interesting to discuss traditional watchmaking with a visionary of new technologies - far away worlds come together”. After visiting the manufacture in Fleurier, the restoration workshops, meeting Michel Parmigiani and the whole team of watchmakers, Ilya commented on his impression and the choice of the watch for himself: “The combination of art, tradition and technology, and most importantly, craftsmanship of the people who create the watch Parmigiani, impressed me the most. Every person at the manufacture is a true professional who does the work with a great soul. Each product is a stunningly complex mechanism, which uses both traditional elements and completely new technological solutions. The company where lives the strength, history and craftsmanship - something you always want to be a part of”. CEO Group-IB. Ilya Sachkov created a company, which over the years became one of the world’s infosecurity leaders. Ilya is a member of the expert council of the State Duma committee for public communications policy, IT and communications, and of the expert committees of the Russian Foreign Ministry, the Council of Europe, and OSCE in the sphere of cybercrime. He is also a member of several international associations in the sphere of information security. In the years of 2015, 2016 and 2017 he received EY Entrepreneur of the Year National Award in the IT category. In 2016, Group-IB CEO ranked among the 30 under 30 entrepreneurs according to Forbes magazine. Since the year of 2017, has become Bauman Moscow State University’s Associate Professor of information security.